Very well organised trip,train trip from Osaka to Himeji, escorted all the way. Very informative guide. Wonderful tour of Himeji Castle in the sunshine with cherry blossom at its peak! Recommended. We had a wonderfull time. Our guide Suzikukiki was fantastic she had great historitcal informatuion and always made sure we were all together. Our guide was great with excellent English. The whole tour was on public transport which was inappropriate considering there were over 15 on the tour. The walk from the station to the castle was 30 mins each way and a waste of time as the guide was unable to communicate with such a large group on the walk. It was also a pity that lunch was not near the castle. With hindsight and having been to Japan before we wish we'd done this trip on our own. Mrs Mijuki our guide was very well oganisted, frendly and very well educaded about this trip and much more! 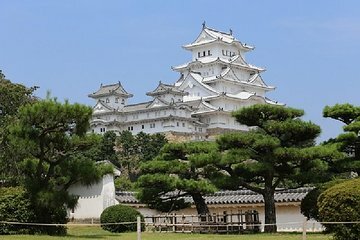 The Himeji castle is actually a more interesting point as the castle of Osaka and Kyoto, we have see all of them. The bridge is also a nice place to watch, espacially the view through the glass bottom to the see. EXTRAORDINARY. The trip to Himeji Castle gave us plenty of surprise and our guide are very knowledgeable. Very educational. It afforded us to have various glimpses of the beautiful Himeji Castle -- from afar and up close-- and enough time to explore inside. The tour of the Akashi Kaikyo Bridge was also an exhilarating experience. Very good, efficient tour guide as well. The lunch was superb!